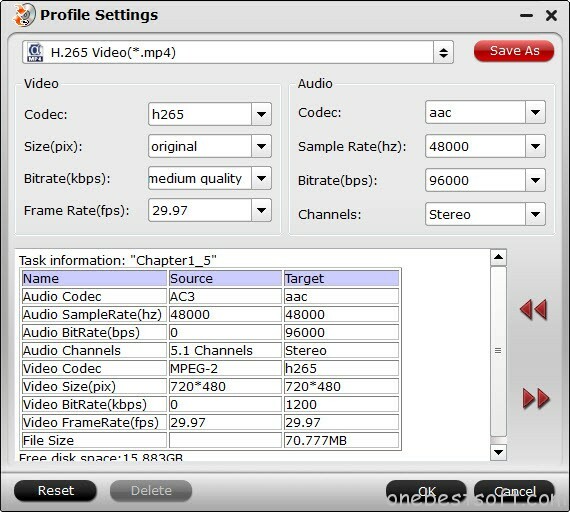 A Blu-ray Ripper is made for providing users a large range of options so that they can enjoy their Blu-ray movies more flexibly, like on computer or on mobile devices. According to diverse of usages of Blu-ray ripped output, you need to choose a video codec for the outcome of Blu-ray Ripper. And to rip Blu-ray to H.265 is best recommended is a new trend for many video lovers. High Efficiency Video Codec (HEVC) is the successor to the H.264 compression standard and offers twice the compression while still maintaining the same high quality. This means you can store your large Blu-ray collection in UHD on your devices at half the normal file size! Top Blu-ray to H.265 Converter/Encoder? Then you need a powerful Blu-ray to H.265 Ripper software to transcode your Blu-ray to H.265 format. Here the latest Pavtube BDMagic (version 4.8.2.0) is just masterful at the job of converting Blu-ray and DVD to MP4 H.265 video to help you get a high quality movie while reduce the disc possession up to 50%. As a prominent Blu-ray converter software, is also enables users to convert Blu-ray/DVD to almost any common video format such as VOB, FLV, WMV, AVI, MKV as you need and rip them for playback on versatile PMP devices (iPad, iPhone, Apple TV, Xbox, PS3, Android. Windows RT/Pro tablets and phones, etc). Here is a tutorial video on how to do Blu-ray to H.265 conversion. How to Convert Blu-ray to H.265/HEVC MP4? Launch this Blu-ray to H.265/HEVC Ripper and click “File” button to import Blu-ray movies into the program. DVD/BD discs and folders are also supported. Tips: For backing up Blu-ray discs, the button on the top of the main interface can help you to achieve the goal. P.S. If you like, you can click “Settings” to change the video encoder, resolution, frame rate, etc. as you wish. Keep in mind the file size and video quality is based more on bitrate than resolution which means bitrate higher results in big file size, and lower visible quality loss, and vice versa. After the conversion, click “Open” button on the main interface to locate the result videos and then you can play the Blu-ray movies on your H.265 video players or devices smoothly. Also you can get an all-in-one H.265 encoder and decoder to rip Blu-ray, DVD and convert video to H.265 MP4 for playback.